At a forum on developing cities around China’s Yangtze and Russia’s Volga rivers, top Chinese State Councilor Yang Jiechi said the China-Russia strategic partnership has “entered a new stage”. Yang held talks with Valentina Matviyenko, Chairperson of the Federation Council of Russian Federation on Tuesday in Moscow. Yang co-chaired the forum in the Russian city of Samara in the southwest earlier this week, which is expected to boost Moscow’s diplomatic and economic ties with China. Yang said, “China is willing to carry out strategic cooperation with Russia” to promote “world and regional peace, stability and development”. “The cooperation between noncontiguous regions of the two countries should be strengthened for a win-win deal,” he added. The forum is seen as a step to implement the consensus reached by Chinese President Xi Jinping and Russian counterpart Vladimir Putin at a conference held in Shanghai last month. Xi hosted Putin in China last month during which the two allies signed a massive $400 billion natural gas supply deal. The deal is aimed at offsetting attempts by the EU and US to throttle the Russian economy through sanctions over the Ukraine crisis. 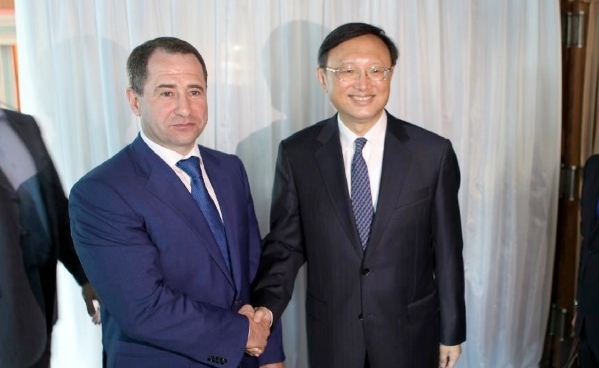 Russia is a major trade partner of China. In the first four months of 2014, trade volume grew by 3.4 per cent year on year to $29.06 billion, official statistics showed. Russian President Vladimir Putin will meet “ally and friend” Xi Jinping during the 6th BRICS Summit in Brazil on July 15th. Apart from strengthening the BRICS bloc of emerging economies, the two leaders are slated to hold bilateral talks.